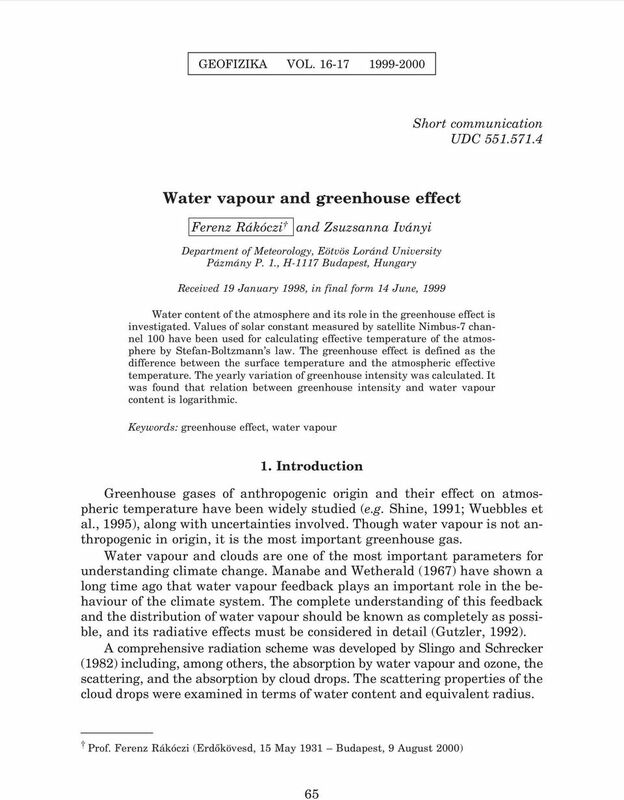 Download "Water vapour and greenhouse effect"
4 68 F. RÁKOCZI AND Z. IVÁNY: WATER VAPOUR AND GREENHOUSE EFFECT cycle. 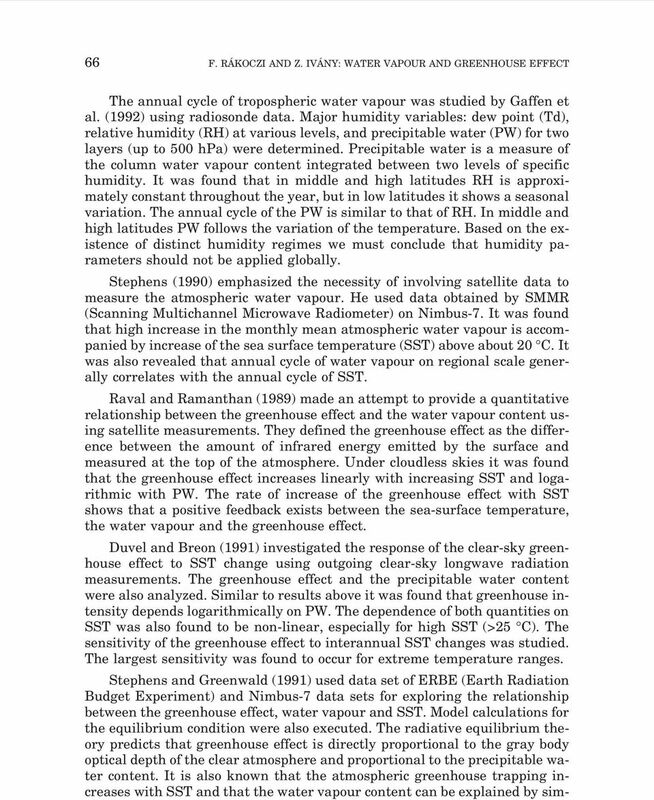 The author refers to recently analyzed data from the NOAA weather satellites showing that independent of seasons the water vapour content of the atmosphere increases throughout the troposphere as a function of increased sea surface temperature. It is also suggested that for the observation of hydrological cycle traditional operational weather data and satellites must be combined. Summarizing the results above it can be concluded that there are two main types of studies. One type states that there exists a linear relationship between the greenhouse effect and the logarithm of water content. The other type argues this statement stressing that there are many complicating mechanisms in the atmosphere, which make determination of positive feedback of water content effects on the whole atmosphere doubtful. The water vapour feedback in the lowest troposphere is positive, however the quantity of water vapour in the upper troposphere is not well-known, since it mostly depends on transport processes. 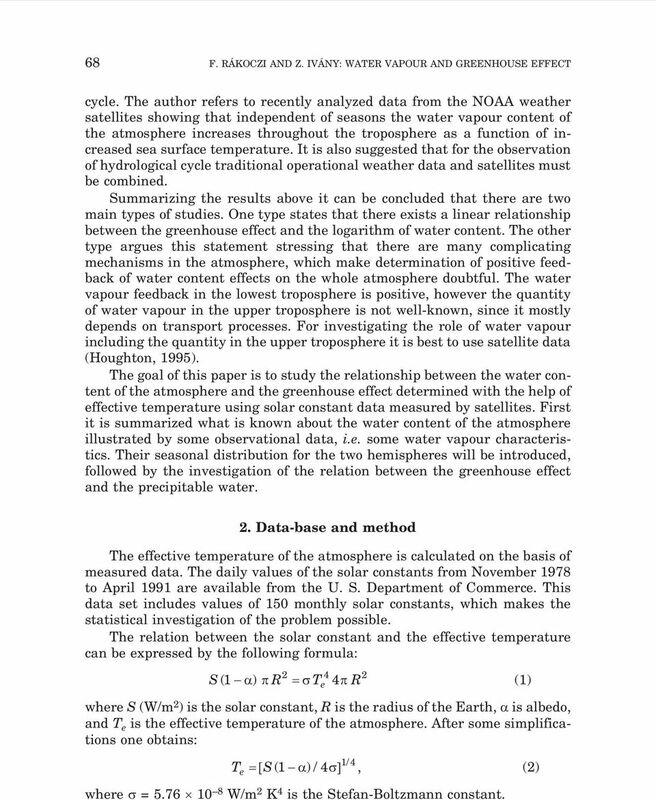 For investigating the role of water vapour including the quantity in the upper troposphere it is best to use satellite data (Houghton, 1995). 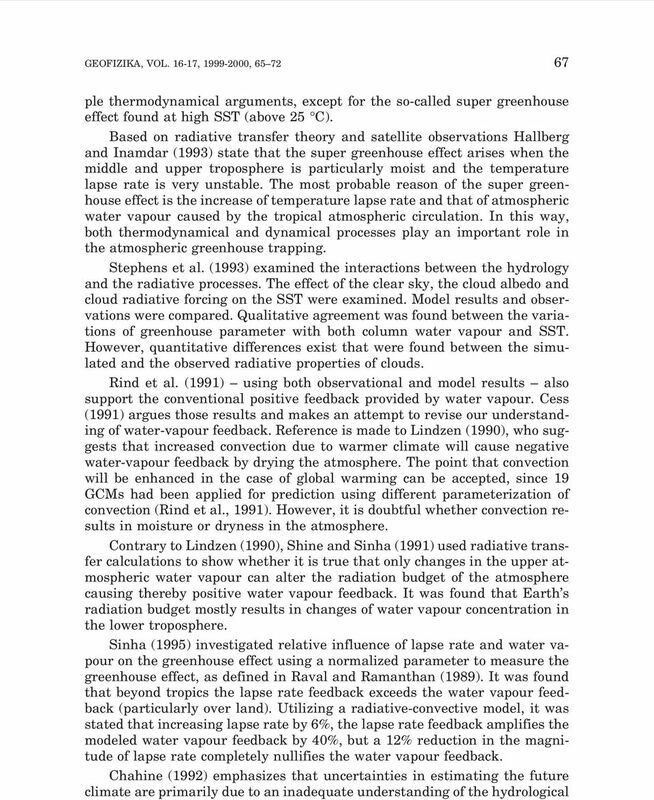 The goal of this paper is to study the relationship between the water content of the atmosphere and the greenhouse effect determined with the help of effective temperature using solar constant data measured by satellites. First it is summarized what is known about the water content of the atmosphere illustrated by some observational data, i.e. some water vapour characteristics. Their seasonal distribution for the two hemispheres will be introduced, followed by the investigation of the relation between the greenhouse effect and the precipitable water. 2. 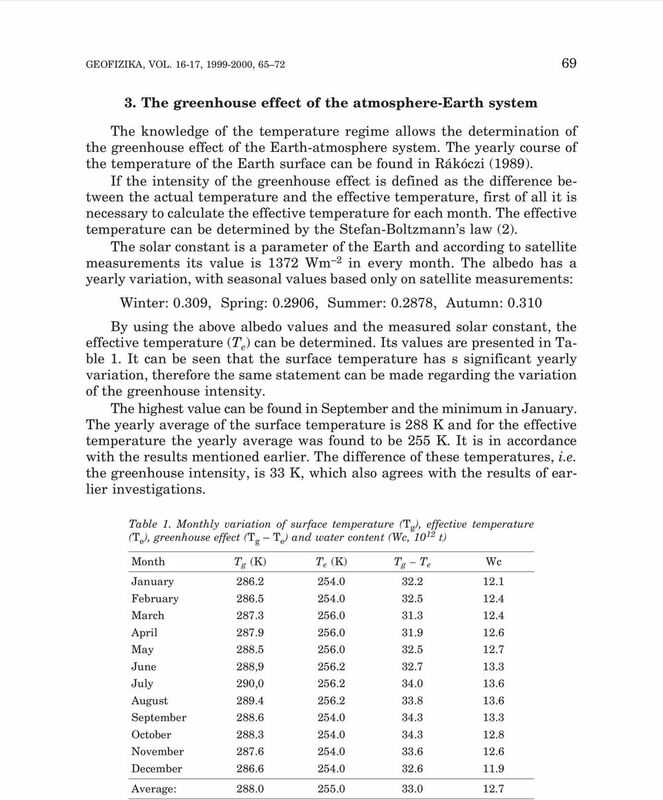 Data-base and method The effective temperature of the atmosphere is calculated on the basis of measured data. The daily values of the solar constants from November 1978 to April 1991 are available from the U. S. Department of Commerce. This data set includes values of 150 monthly solar constants, which makes the statistical investigation of the problem possible. The relation between the solar constant and the effective temperature can be expressed by the following formula: e S( 1 ) R T 4 R (1) where S (W/m 2 ) is the solar constant, R is the radius of the Earth, is albedo, and T e is the effective temperature of the atmosphere. After some simplifications one obtains: / Te S( 1 )/ 4 14, (2) where = W/m 2 K 4 is the Stefan-Boltzmann constant. 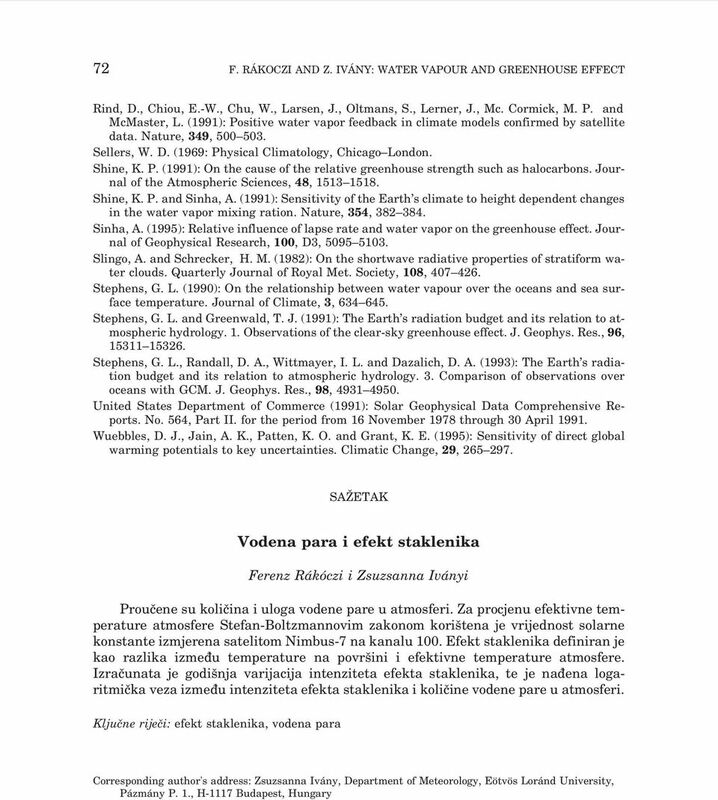 6 70 F. RÁKOCZI AND Z. IVÁNY: WATER VAPOUR AND GREENHOUSE EFFECT We have tried to look for correlation between these results and the water content of the atmosphere. The water content of the atmosphere is the mass of the water in a column between the surface and the 300 hpa level expressed in tons. These values are tabulated in the last column of Table I. It shows that there is a minimum in winter and a maximum in summer. The computed dependence of the greenhouse intensity on the water content (Wc) is presented in Fig. 1. It can be seen that a logarithmic relation exists between these variables. The equation of the logarithmic function is the following: T g T e = ln (Wc) Figure 1. 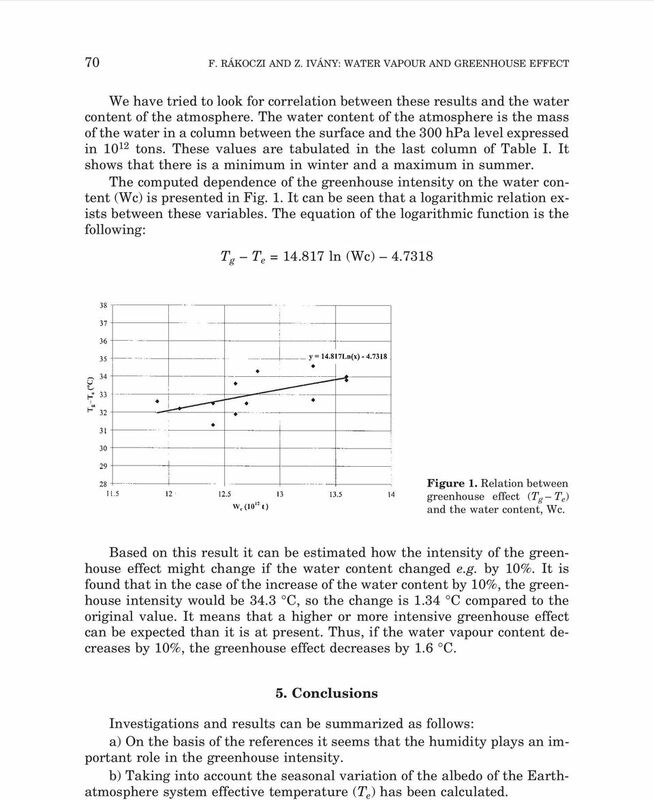 Relation between greenhouse effect (T g T e ) and the water content, Wc. Based on this result it can be estimated how the intensity of the greenhouse effect might change if the water content changed e.g. by 10%. It is found that in the case of the increase of the water content by 10%, the greenhouse intensity would be 34.3 C, so the change is 1.34 C compared to the original value. It means that a higher or more intensive greenhouse effect can be expected than it is at present. 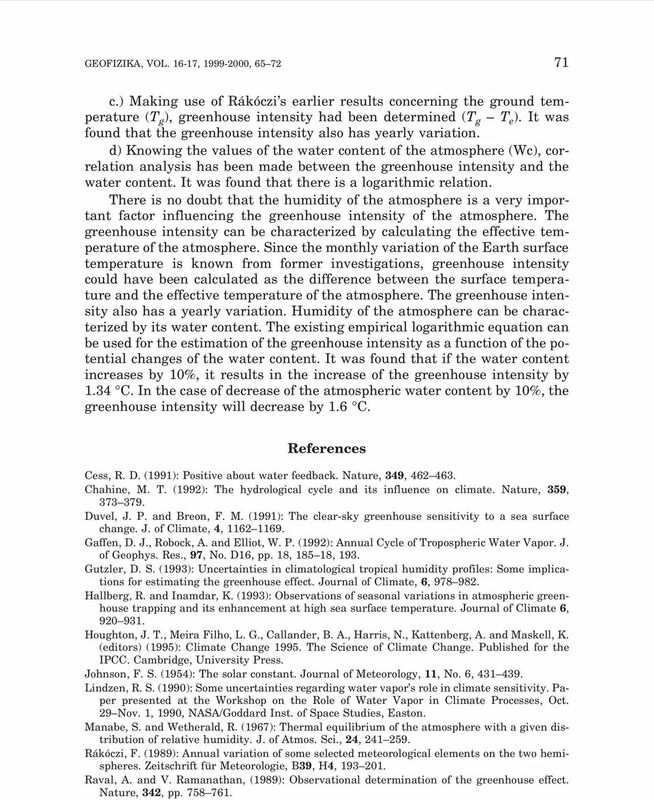 Thus, if the water vapour content decreases by 10%, the greenhouse effect decreases by 1.6 C. 5. Conclusions Investigations and results can be summarized as follows: a) On the basis of the references it seems that the humidity plays an important role in the greenhouse intensity. b) Taking into account the seasonal variation of the albedo of the Earthatmosphere system effective temperature (T e ) has been calculated. A new positive cloud feedback? Reading Assignment: A&B: Ch. 3 (p ) CD: tutorial: energy balance concepts interact. ex. : shortwave & longwave rad. LM: Lab. Chapter Overview CHAPTER 6 Air-Sea Interaction The atmosphere and the ocean are one independent system. Earth has seasons because of the tilt on its axis. There are three major wind belts in each hemisphere. The impact of parametrized convection on cloud feedback. Relative humidity. Climent Ramis, Romualdo Romero and Sergio Alonso. Meteorology Group. Department of Physics. University of the Balearic Islands. NASA Facts National Aeronautics and Space Administration www.nasa.gov The Balance of Power in the Earth-Sun System The Sun is the major source of energy for Earth s oceans, atmosphere, land, and biosphere. CLIMATE CHANGE, HUMAN SYSTEMS, AND POLICY- Vol.I -Anthropogenic Climate Influences - Boroneant C.E. Investigating mechanisms of cloud feedback differences.